We are excited to announce our partnership with Land's End! This gives our families more options for daily school wear and a portion of all sales goes right back to Marquette Catholic School! There are some cobalt blue options currently on the Land's End site, please know that these are for SPIRITWEAR ONLY, and not part of the daily uniform. Also included are some great cinch sacks, backpacks, canvas bags, and lunch sacks. By no means are these items required, but they are built to last and are now included as an option to embroider if you so desire. In August, when you pick up your child's school supply list, you will notice that they need a pair of wind/athletic pants to be kept at school. These are worn during recess over their khaki's to help protect them (and their pants/tights) from the outdoor elements. You'll find options for these here as well. 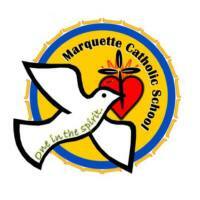 If you are new to Marquette and have questions about the uniforms, please don't hesitate to ask your child's teacher, or a veteran parent. We've all been there!